The primary facet of Christian baptism’s meaning is IDENTIFICATION with Christ. God ordained baptism as a key to how to live with Christ in His new life, within God’s kingdom having been saved from the evil kingdom of the satanic world system. As soon as a person believes and puts their trust in The Lord Jesus as saviour they enter into eternal life; as an individual, they are regenerated and given the free gift of eternal life ( John 3: 16, John 5:24). Receiving eternal life then, as an individual believer is a personal matter. God’s full salvation however, is concerned with MORE THAN RECEIVING ETERNAL LIFE INDIVIDUALLY – It also involves a communal aspect. God’s full salvation also involves coming out of one fellowship and kingdom and being placed by God into another kingdom. As we continue we will see that salvation involves both ENTERING INTO INDIVIDUAL ETERNAL LIFE and COMING OUT FROM THE SINFUL DOMAIN AND FELLOWSHIP OF SATAN’S KINGDOM. In Baptism, The AUTHORITY OF THE NAME OF JESUS not only identifies the believer with the death of Christ, freeing him from the fellowship of the evil satanic world system – It also identifies the believer with Christ’s glorious and powerful resurrection, raising him or her with Christ into the new kingdom of The Lord Jesus! So we see that Salvation includes both a coming out of the evil world system and an entering in to the eternal life of God. Romans 6:3-4 – Don’t you know that all of us who were baptized into Christ were baptized into his death? We were therefore buried with him through baptism into death in order that just as Christ was raised from the dead through the glory of the Father, we too may live a new life. Paul introduces the thought of burial; he says that with Christ we have been buried through baptism into death. In the natural realm, a person dies first and then afterwards is buried. But Paul says that that we are first buried, and then we enter into death. According to the Bible, we, the believers, are buried into death with Christ and through baptism. Baptism is more than symbolism. It carries the authority of The Lord Jesus Christ and it is very powerful when linked with faith! When a sinner repents and believes in the Lord Jesus, he or she should then immediately be baptized into Christ. To baptize this new believer into Christ is to put him into the death of Christ. When he is baptized, he is actually buried. This burial results in death to his or her old sinful nature. This is what it means to be buried with Christ through baptism into death. Every person waiting for water baptism is a person in the process of dying. Through baptism such a person is put to death. Having been identified with Christ and with His death, he is immersed in water and is buried. Through baptism, he enters into the actual experience of death with Christ. This burial has a glorious consequence. As Christ was raised from among the dead through the glory of the Father, (Rom 6:5), we also may walk in newness of life. This indicates that after baptism we become a new person in resurrection. When we are immersed in the water, we enter into death. But when we come out of the water, we enter into resurrection. We all need to have such a wonderful realization and understanding of baptism. In Romans 6:5 Paul goes on to say, “For if we have grown together with Him in the likeness of his death, we shall be also in the likeness of His resurrection.” We have grown together with Christ in the likeness of his death, that is, in the baptism mentioned in verse 4. Now we see that we shall also grow in the likeness of His resurrection, that is, in the newness of life, also mentioned in verse 4. The important point is that to be baptized is to grow. One who has been baptized has grown in the likeness of Christ’s death and now is growing in the likeness of His resurrection. Christian baptism is your personal identification with the greatest act of human history. The greatest act in all history was the death, burial and resurrection of Jesus Christ. Your guilt of sin before God is removed the moment you trust in Christ. Baptism is your personal testimony to, and the inward assurance of, your passage from the old life to the new life. You died to your old life of sin as you identify with Christ’s death and you rise ‘ from the waters’ in resurrection newness of life with him! According to the writings of the apostle Peter the flood waters are a picture (type) of Christian baptism. 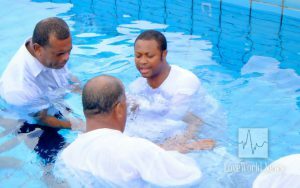 Baptism in the mighty Name of Jesus and with his authority is powerful in translating a believer from the evil kingdom, society or realm of this sinful corrupt world system into the kingdom of out Lord and saviour Jesus Christ. Christian baptism is far more than just a symbol of our death with Christ and our being raised to new life in him. It contains the authority of the Name of Jesus Christ and a powerful grace is given to the believer in baptism. As the believer full of Christ’s presence and faith submits to the ordinance of baptism, faith in the operation of God brings great blessing (Col 2:12). The believers faith is not from himself; it is the gift of God (2 Pet 1:1). The Lord who is the Author and Perfecter of faith (Heb 12:2) in baptism by the faith produced by the operation of the living God brings the experience of resurrection life to the believer. Receiving eternal life is an individual matter. As soon as a person believes the gospel and places their faith in Christ, in that instant they are eternally saved and receive the free gift of eternal life! They will never perish, (John 3:16, John 5:24). However God’s full and complete salvation involves is more than an individual matter. It has a deeper collective perspective. God’s full salvation involves coming out of the corrupt God-rejecting world society and system; it involves coming out of that kingdom into a new kingdom. “He that believes and is baptized shall be saved. 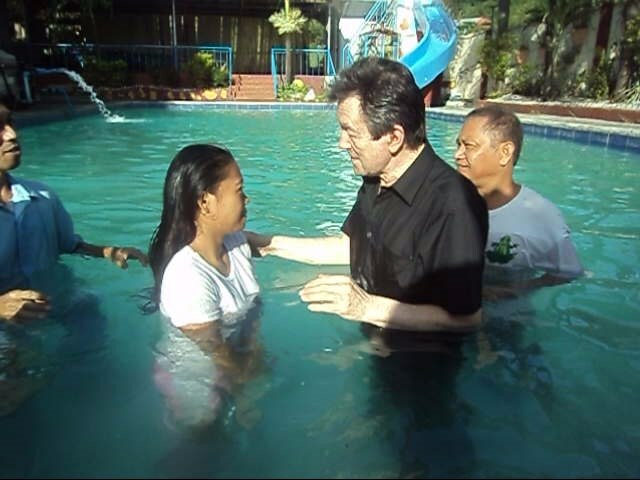 ( Mark 16:16)” Having believed and been baptized, it is now an open fact where one stands. But with that inward reality, baptism puts one outside of the world and terminates the former relationship with the world. Baptism, therefore, is separation from the power and influence of the world, unto God. This is Christian baptism’s meaning! Books on Christian baptism ( as well as many other inspiring books, CD’s Christian music and bibles) can be found by proceeding to the Family Christian Book Store Page.